Figure 5. 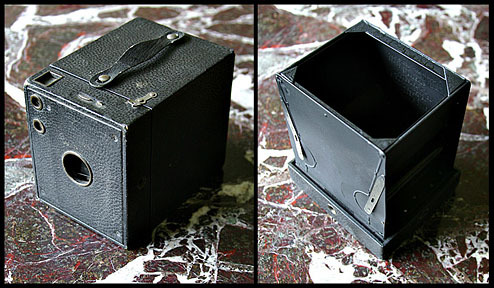 An inexpensive Kodak Brownie 3B box camera adapted for ¼- plate wetplate use by gluing aluminum corners onto the interior rollfilm carriage. This adaptation allows thin metal sheets to be used in the camera in order to make ferrotypes or aluminotypes. Glass plates are too thick to be used in the camera.